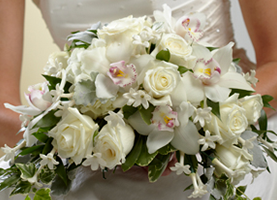 Our professional wedding floral designers will provide bouquets and corsages for your special day. Let San Francisco Floral create and deliver beautiful flower arrangements to brighten your day. San Francisco Floral in Fresno, CA is your one-stop for fresh local flower arrangements for any occasion. 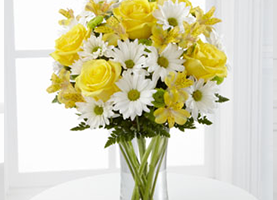 Call us to have your flowers delivered to your friends and loved ones to bring sunshine to their day. You will make any day special when you send someone a bright and cheery vase filled with daisies, carnations, and mums. We arrange beautiful vases of flowers to dress up your table for any occasion and holiday. 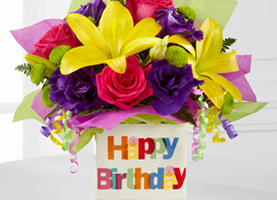 Birthday floral arrangements are a wonderful gift. We can deliver to homes, businesses, and hospitals in the local area, usually on the same day that you order. Do not worry about your floral gift arriving on time; timely delivery is one of the benefits when you order locally from San Francisco Floral. We have the fresh roses and orchids that will make your wedding beautiful. We can also get specialty flowers from around the world to match your theme and colors. Your wedding day flowers should be exactly as you pictured to make your day memorable. For more somber occasions such as funerals, our professional and compassionate staff will help you choose the most appropriate sympathy arrangement. A peace lily expresses care and concern for the family. If you need casket sprays or memorial wreaths, our expert designers will create a beautiful memorial. San Francisco Floral is your one-stop flower shop for gifts and gourmet baskets for holidays and businesses. Whether you need an elegant gift to greet a special guest or a bouquet of balloons to welcome a new baby, we will deliver it to the recipient on time and as ordered. We are locally and family owned and have been in business for more than 100 years. Your 100% satisfaction is our goal. You can trust us with your flowers and gift deliveries. Call today or order online through our safe and secure system.